The North Tower is now the North Pool, the square pit that held its foundations here a four-sided fountain feeding a reflecting pool that sits within the tower’s footprint. The names line the sides, overlooking the water. The gaps in the bronze met the modest title and theme of the memorial: “Reflecting Absence”. While many were simply happy to take solace in the act of touching their loved ones’ names, some relations placed the Stars and Stripes in the grooves of the letters, others flowers. Many made rubbings to take home, to frame perhaps, or put away for some moment of solitary reflection. A woman kissed the name of Steven John Mercado, only 38 years old and one of 343 members of the Fire Department of New York who perished on that Tuesday morning. Photographs, letters and firemen’s helmets were placed next to other names. Of the 2,753 people consumed in the collapse of the Twin Towers 1,124 have no resting place, pulverised into extinction or consumed by a jet fuel fire that softened steel. August Larsen, just nine years old, was one of those making a crayon rubbing, in his case of the name of his father, Scott Larsen, a firemen who died when the South Tower collapsed. August was born only a few days after his fatherâ€™s death. As he attempted to connect with the father he never knew yesterday, the names of the victims were being read out by relations. From Gordon Aamoth to Igor Zukelman, no one was forgotten. For more than three hours it continued to the accompaniment of classical music. Some of those doing the reading had been too young to know the mothers or fathers they lost that day. Peter Negron returned to Ground Zero eight years after he had stood there as a nervous 13-year-old boy, reading a poem about the stars that comforted him in the nights after his father was stolen. Mr Negron surveyed Ground Zero on Sunday as a man of 21, speaking of his regret for the rites of passage he should have shared with Pete Negron, a 34-year-old environmental worker from New Jersey, whose desk was on the 88th floor of the World Trade Center. â€œIâ€™ve stopped crying but I havenâ€™t stopped missing my dad,â€ he said. â€œI wish my dad had been there to teach me how to drive, ask a girl out on a date, see me graduate from high school,â€ he said, before telling how he had become a father figure to his brother Austin, who was two at the time of the attacks. Even in disaster some good comes, friendships forged between those thrown together by grief, for example. The names of Christopher Epps and Wayne Russo sit side by side on the memorial. Christopher, 29, an employee of Marsh and McLennan, and Wayne, 37, another employee of the firm, did not know each other. Their families met after their deaths, and so close did their bond become that they chose to place their names together. â€œItâ€™s the closest Iâ€™ll ever get to her again,â€ said Mary Dwyer of her sister, Lucy Fishman. Lucy was 36 when she died in the South Tower. The panels carrying the names are backlit so they can be read at night, and their temperature is controlled so that they are comfortable to the touch. â€œI feel so happy this has been put together,â€ said Peter Rauss, a 19-year-old medical student from New York, as he stood by the name of his uncle, Philip Ognibene, a stockbroker. The day itself on Sunday had begun, like that fateful day a decade earlier, with blue sky. Silence fell across Manhattan at 8.46am, 10 years exactly from the moment when American Airlines Flight 11, a Boeing 767, struck the North Tower. For 17 minutes it was a terrible, inexplicable accident â€“ until United 175, another fuel-laden 767 flew into the South Tower. There were four silences marking the impacts of the airliners that day, the third, American 77 at the Pentagon and the fourth, United 93, at Shanksville, Pennsylvania. Two more followed marking the collapse of the towers. 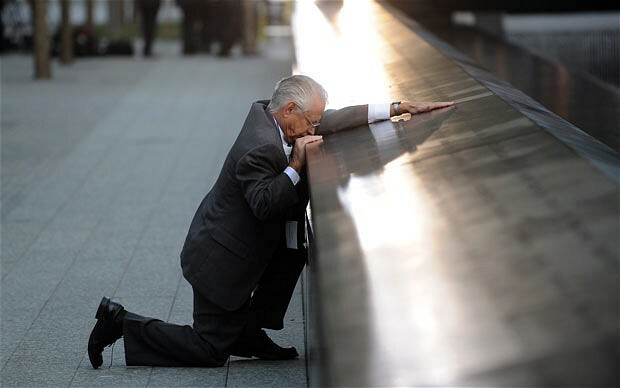 Each silence was broken by the reading of more names, a steady drumbeat of sorrow until all 2,982 who died on September 11 and in the 1993 World Trade Centre bombing had been remembered. It took 10 minutes from Gordon Aamoth Jr, a 32-year-old investment banker, to the end of the As. Finally, more than three hours later, came Igor Zukelman, a 29-year-old Ukrainian wealth manager. Readings were given by the statesmen who guided New York and the US through their darkest hours, and those attempting to steer America through the doldrums it has never really escaped. â€œWe will not fear, even though the Earth be removed, though the mountains be carried in the midst of the sea,â€ said President Barack Obama, reading from the 46th Psalm. George W Bush read from a letter sent in November 1864 by Abraham Lincoln to Lydia Bixby, a widow from Boston who had lost five sons in the Civil War. â€œHow weak and fruitless must be any words of mine which should attempt to beguile you from the grief of a loss so overwhelming,â€ Lincoln wrote. â€œBut I cannot refrain from tendering to you the consolation that may be found in the thanks of the Republic they died to save.â€ Christine Box, whose brother Gary was a fireman, clutched a photograph of him running to the scene. â€œHe answered his last call,â€ it said. â€œI have to be here,â€ said Daniela Notaro, who lost her sister Rosaria Reneo. â€œItâ€™s where she never came home fromâ€. â€œIt will never feel like 10 years,â€ said Mary Beth Dougherty, mourning her brother Kevin Murphy. â€œItâ€™s just that the children have gotten olderâ€. For some, the horror of that day has dimmed not at all. The memorial may bring closure of sorts. â€œThere has been no escape,â€ said Victor Colaio, who lost his sons Stephen and Mark, both brokers with Cantor Fitzgerald. â€œThereâ€™s just nowhere to go. If you sit down to eat, itâ€™s purely to sustain yourself. The taste is not the same.